SNK’s flashy, female-led brawler will be getting a new addition to its line-up of characters in October 2018. She is a female version of Street Fighter EX’s Skullomania called Skullo Mania. This marks the second cameo appearance for the game, following Million Arthur’s Thief Arthur. But why is Skullomania, an established male character, suddenly female, you ask? The answer is very simple. The antagonist of the game, Kukri, creates his own pocket universe in which our fellow heroine’s are trapped. So Kukri is calling the shots, here, and I guess he just really wanted to see what a female Skullo Mania would look like. Here is the official SNK Heroines: Tag Team Frenzy Skullo Mania trailer. Following the announcement, SNK has stated that more SNK Heroines: Tag Team Frenzy cameos will follow in the future, adding to what is already an impressive roster of characters for players to choose from. But when it comes to Skullo Mania, it seems we can expect agile attack combos that quickly morph into deadly breakdance routines. She appears to be ever the dancer in a world of super-powered punches. 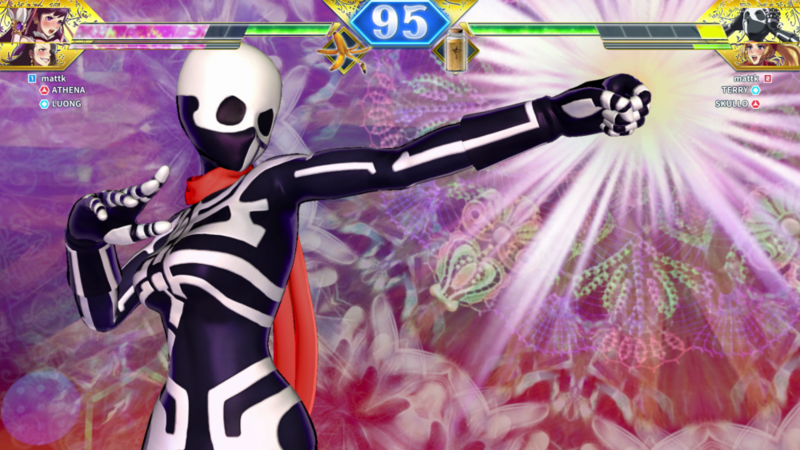 You can get Skullo Mania on October 11, 2018 in SNK Heroines: Tag Team Frenzy for the Playstation 4 and the Nintendo Switch. With the promise of more characters to come, which hard-hitting heroines do you want to see make an appearance? Let us know below!